That's him on the other end of that teeny-tiny Brunton Echo Pocket Scope Monocular. 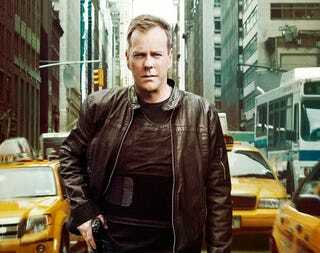 He spying (duh) on you to see if you are making preparations for the premiere of 24 on January 17. Oh, and he's packing a 9mm, so get that DVR set. Jack's weapon of choice is said to be the HK USP Compact 9mm, a scaled down version of the full size HK USP (Universal Self-loading Pistol) series. It's known as one of the most reliable, accurate, and concealable pistols available. So get ready for Jan. 17, when Jack comes back to visit you in your living room for Season 8 of 24. I'm sure he'll come via your television set, not by crashing through your windows with his 9mm trained on some reality show that you've foolishly chosen to watch instead.